One of the most fascinating events I have ever participated in took place on the hot summer afternoon of July 26, 2015 when a statue of Mother Catherine Spalding was dedicated on public property in front of the Cathedral of the Assumption. As a former pastor of that sacred place, it hit me more than once that I had served the Church and the people of downtown Louisville on the same holy ground where she and her Sisters had served. I have always been proud of the fact that I had been taught by her community from 1950-1958 down in St. Theresa Academy and later St. Theresa School in Rhodelia, but I found myself additionally proud that I had served in the very same place where Mother Catherine had served. I felt connected to her in a very special way that day. Catherine Spalding was born in 1793. At the age of 4, shortly after moving to Nelson County, her mother died. She was raised in several different homes before she was 10 years old, including one home with 14 children. In these formative years, she learned independence, the value of hard work, an enduring spirit and the vital importance of education, especially for young women and girls. It truly seems unbelievable in today's times, but in 1812 at the age of 19, Catherine was elected by her peers to lead the formation the Sisters of Charity of Nazareth. By the time of her death, the order extended to over 100 members in 16 convents. Today the community has more than 600 members worldwide. During the dedication, as I sat there thinking of Mother Catherine and her Sisters, I realized that since ordination I have been “surrounded by a cloud of witnesses.” I was honored to be pastor of Holy Name of Mary Church in Calvary, Kentucky, the home parish of Martin John Spalding who went on to be the fourth bishop of Louisville and later archbishop of Baltimore. 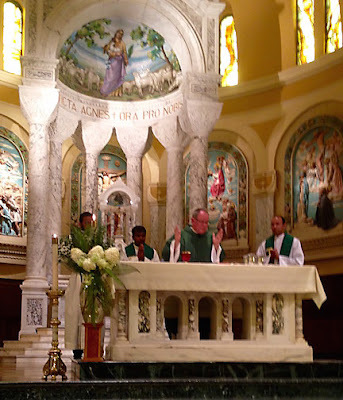 In Louisville, I was successor to Stephen Badin, first priest ordained in the United States, who was pastor of the city’s first parish, St. Louis, which later evolved into the Cathedral parish. I was successor as well to Ignatius Reynolds who became bishop of Charleston, John McGill who became bishop of Richmond and John Lancaster Spalding who became bishop of Peoria. Bishop Medley of Owensboro had been my associate pastor. I remembered Bishop Flaget, whose undercroft tomb I had visited hundreds of times, and the fact that he had lived and preached on same property as I had. I remembered Archbishop Kelly, with whom I had lived for fourteen years in the same house where famous cardinals, bishops, priests and dignitaries had lived or visited. As my mind reviewed the history of that sacred place, I felt connected to Mother Catherine. After all, we had both served the parishioners and prayed there, each in our own time. Me Give a Monastic Retreat? 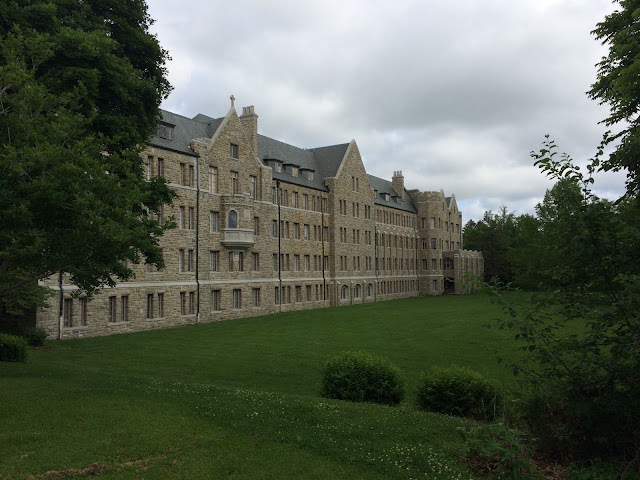 During the week of June 1-5, 2015, I was honored to be asked by Abbot James Albers to conduct the monastic retreat for the monks of St. Benedict Abbey in Atchison, Kansas. 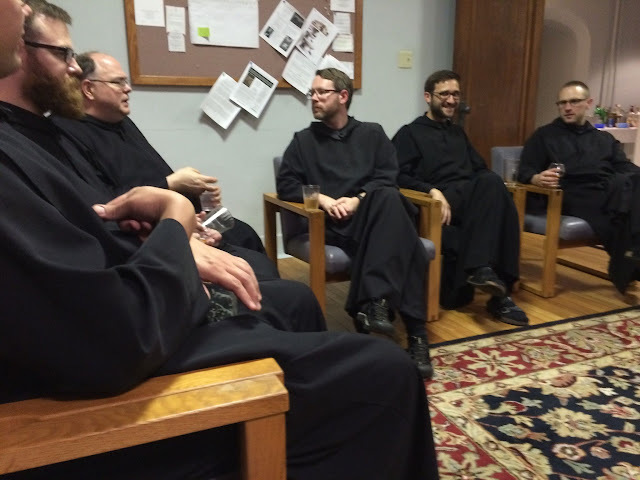 The title of the retreat was "Renewing the Radical Communitarian Dimension of Monastic Life One Monk at a Time." 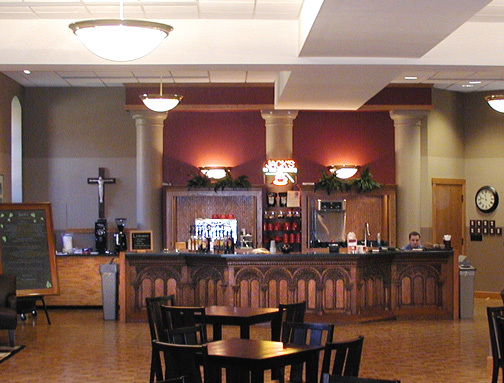 They had heard about the retreat that I had given to the monks at St. Meinrad Archabbey the year before. Unlike St. Meinrad Archabbey, which operates a seminary, St. Benedict Abbey operates a college called Benedictine College. It is very much like Bellarmine University here in Louisville - both in size and style. These monks came to Kansas in 1856. Here are some photos from that great experience. The backside of the abbey, facing the river below, looks a lot like Downton Abbey on the TV series. Places like these are always adding on as the years go by. This is the guest house addition. The conferences were given in the monastic church. No retreat should end without a party. 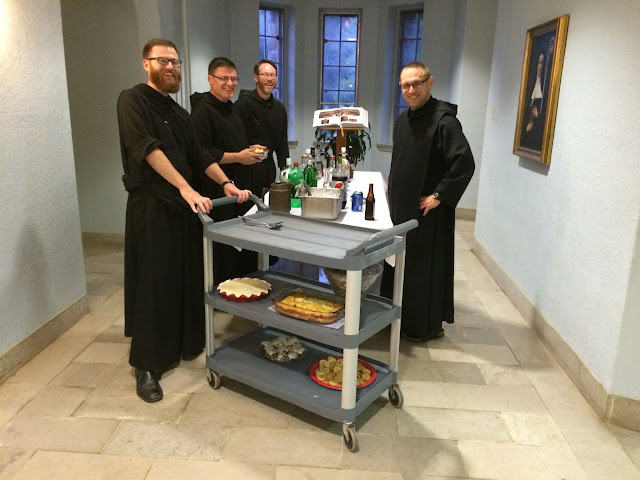 A few of the brothers are prepared to serve the snacks and the drinks. Is that beer and liquor on that table? Yes,it is! Things got a little wild as the evening wore on! The monk in the middle is Father Simon Baker. He is the newest priest in the community. He went to seminary at Saint Meinrad and I had him in class last year. He is a very talented young man and will be a great asset to his community. 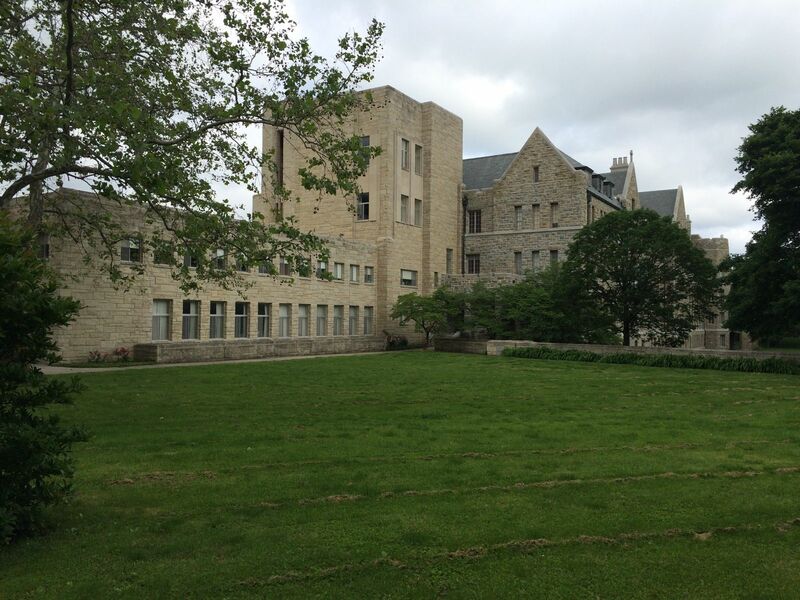 One of the campus buildings at Benedictine College on the same campus as the monastery. 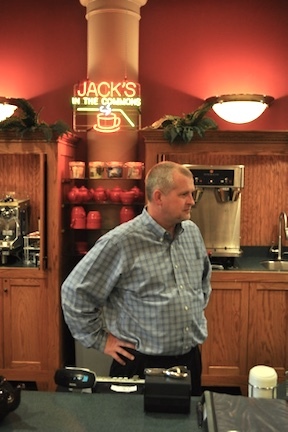 One of the things that I have gotten into the habit of doing since I retired is to meet other people at the coffee shop next to Nord's Bakery on Preston Street. I am probably wrong, but I like to think we are one step up from the old guys who take over McDonald's. Wendy's and White Castle. Here is a shot of the people I run into regularly.The group just "sort of formed." Below - a few photos of one of my projects at Saint Meinrad Seminary - a nice coffee and soft-serve ice cream shop, called Jack's in the Commons. 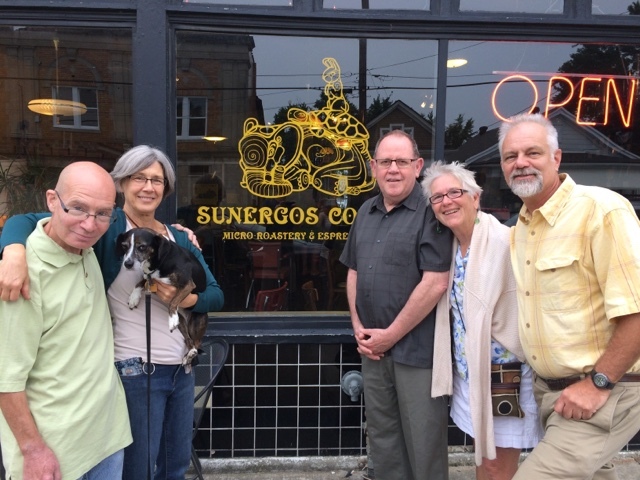 The good people at Sunergos on Preston Street in Louisville helped me pick out the equipment we needed for Jack's and Jacks, in return, buy their coffee beans from Sunergos. 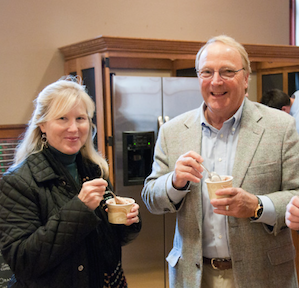 Rea and Tom Clark, donors of the soft-serve ice cream machine in Jack's in the Commons. It is hard to believe, but I began my 16th year as a part-time campus minister at Bellarmine University with our Convocation Mass at St. Agnes Church across the street from the campus on August 16. 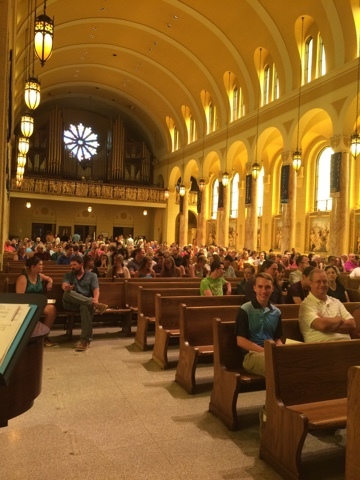 The placed was packed by the time Mass started. 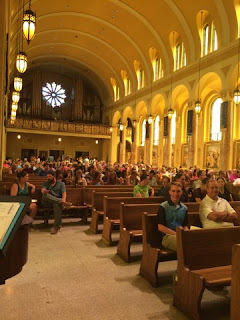 You can read the homily on another post on this blog. 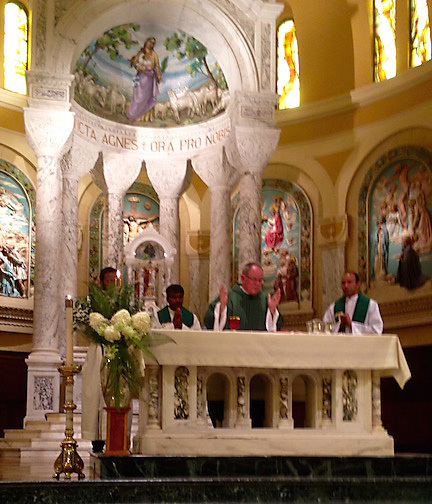 Father George, Father Antony, me and Father John. The priests surrounding me are OFM Conventual Franciscans from India helping out in campus ministry at Bellarmine. 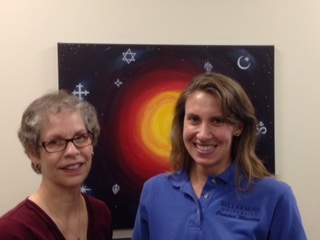 Melanie Prejean Sullivan - Director of Campus Ministry on the left and on the right, Karen Shadle - Assistant Director of Catholic Worship and Campus ministry. Thanks to them for all of their help at the convocation. Regular Sunday Masses at 6:00 pm begin August 23 in Our Lady of the Woods Chapel on campus. A third book The Lord is Close to the Brokenhearted (a collection of homilies from Bellarmine Blue Christmas Masses for the grieving) will be available at Christmas time. making the most of the opportunity. Students, you stand at such a “fork in the road.” Starting today and over the next few years, you will have a whole series of important choices to make! As the road continues to fork, you will be free to choose from a variety of paths and each path you choose will have consequences! As you stand at each fork, weighing your options, you need to know that along with the freedom to choose will come the responsibility to choose wisely. In the past, your parents made choices for you and forced you to accept them, then when things did not work out, you could blame them for the consequences of their choices. There is nothing more stinging to live with than the knowledge of a great opportunity missed for which you, and only you, are to blame. The secret to making the most of this opportunity is to stand up to your own laziness and cowardice, to refuse to be ruled by your passions and addictions, to develop the personal discipline to delay gratification and to do hard things for your own good. In other words, you simply must take charge of yourself. Students! Don’t be a fool! 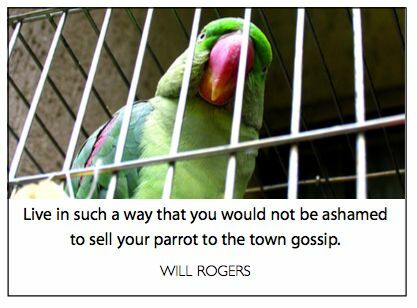 “Watch carefully how you live, not as foolish persons, but as wise, making the most of the opportunity.” If you don’t, you will surely be with those who live to regret it!